Need help to do your laundry? Then, ask this cat to help you! She is so good putting all the garments in the box though she missed 1 – 2. Still, she is qualified to do the laundry! She can also be a big help in catching games! Her catching skills is no joke! Watch the video to see it for yourself. This mean Daddy pranks his daughter by eating her food! Looks like the girl was not amused when she realized her food was lost! Poor baby girl… She didn’t know daddy ate her food! Next time, you should be alert and never ever take your eyes away from your food! I’m not sure what these girls have against Canada but it’s hilarious! Leave Canada right now… according to these kid newscasters… They are reporting about the weather condition in Canada. Canada will experience Tornado and Earthquake according to them. Looks like they have some bad feeling with Canada. BUT they are so cute when they say to leave Canada if they want to stay alive. Do you believe in love at first sight? If you don’t, then watch this video and it will prove you the other way around. 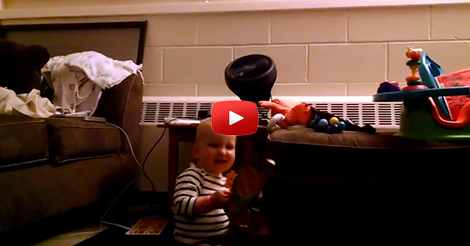 This kid has completely fallen for the girl at first sight! He was complete smitten by the girl’s beautiful face and kissed her right away! Why is this 100 year old grandma so excited? Grandma got so excited on her 100th year birthday! Her clap was full of joy because her grandson finally shave his beard. Looks like the grandma despises the beard so much. She even lend her hand and shave the rest! Dan Naturman auditions at America’s Got Talent. He did a Stand-Up Comic Act that Reveals Dating Disasters. These are so funny because the jokes are true! I couldn’t stop laughing, I hope he did well! Pitbulls ATTACKING Humans… with kisses! Who would love to wake up with kisses on their face? I know I DO! Watch these two sweet Pitbulls licking their owners Face early in the morning. They surely knows how to show their love and affection! Watching this makes me want to own a pet dog again! I miss how sweet and playful dogs can be! Watering the garden is difficult! Meet Misa Minnie, a 20 week old Yorkie, who learned some impressive tricks! She maybe small but she is pretty smart. She knows what get when her owner has a flu, she knows how to dispose tissue in a bin, and she can even PAINT! Watch this video to see her many skills! She is now officially a Therapy Dog for children and people in hospice. This cat has it all figured out! I wonder what sparked his interest in the freezer? Seems so strange to have a cat opening this to get food! Comment if you have a sneaky kitty. Look at these Dogs in Wheelcarts play fetch! Nothing’s holding them back!